From the beginning, heavy drinking was fairly commonplace among the cadets at the United States Military Academy at West Point (founded in 1802). In an attempt to stem this in 1826, the academy’s strict superintendent and the “Father of West Point,” General Sylvanus Thayer, began a crackdown by prohibiting alcohol on campus. As Christmas approached and the cadets realized that the prohibition would put a damper on their traditional Christmas Eve festivities that included consumption of a fair amount of eggnog, a bold few began to plan away around the problem. 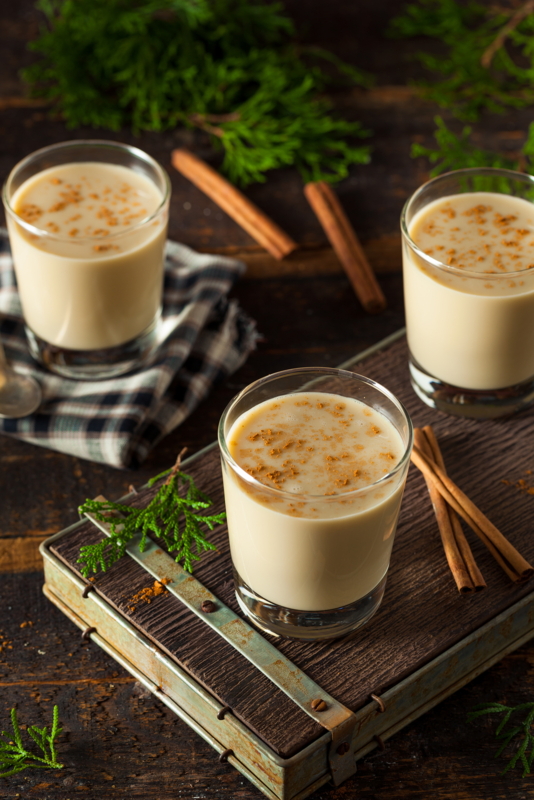 Back then, eggnog was always an alcoholic beverage (see: What is Eggnog Made Of and Who Invented It? ), often made with rum or whiskey. Luckily for the cadets, both liquors were plentiful near campus, being served by three taverns within easy travelling distance: Benny Haven, North’s Tavern and Martin’s Tavern, just across the Hudson River. Determined to make their season bright, a small cadre of cadets set out to smuggle some liquor into the North Barracks and chose Martin’s Tavern across the river as their supplier. A few nights before Christmas, three cadets crossed the Hudson, drank a bit at the bar, then purchased three to four gallons of whiskey to go. They then ferried the contraband back across the river. Met at the dock by a guard, they reportedly bribed him with $0.35 ($7 today) to look the other way while they unloaded the loot and snuck it into their rooms where it lay hidden until Christmas Eve. On the fateful night, the superintendent assigned only two officers to monitor the North Barracks: Lieutenant William A. Thorton and Captain Ethan Allen Hitchcock. Things were quiet at first, and Hitchcock and Thorton went to bed about midnight. At about 4 a.m., however, Hitchcock was awakened by noise coming from one of the cadets’ floors above him. Upon investigation, he discovered a small group of obviously drunk cadets and ordered them to return to their rooms. No sooner had he dispersed that group than Hitchcock realized there was another party in an adjoining room. Crashing that one as well, Hitchcock found these cadets so inebriated that he later reported they attempting to hide under blankets, and one even thought he could avoid detection by stubbornly keeping his face behind his hat. Unlike the first party, however, things got heated in the second room, and after Hitchcock left, the drunk-mad cadets decided to arm themselves with their bayonets, pistols and dirks to attack, and perhaps even kill, Hitchcock. Other cadets who had already made preparations to attack began assaulting Hitchcock and now Thorton, who had joined the fray. Thorton was threatened with a sword and knocked down with a piece of wood, while another cadet actually shot at Hitchcock. Realizing things were spiraling out of control, Hitchcock ordered a cadet sentinel (who apparently had not been invited to the party) to get “the ‘com,” meaning the Commandant of Cadets; however, in their drunken state the rioting cadets thought he had summoned regular army men from a nearby barracks to attack them. Seeking to defend the honor of the North Barracks, even more cadets armed themselves (in total including about one-third of all cadets at the academy), and, as is standard operating procedure in any proper riot, the mob began arbitrarily breaking anything in sight, including windows, furniture and other items. Eventually, the ‘Com came, and since the cadets truly respected his authority, they finally regained a semblance of composure, and the so-called Eggnog Riot ended sometime Christmas day. Over the next week, Inspector of the Academy and Chief Engineer of the Army, Major General Alexander Macomb, entered Orders No. 49 and 98, the latter of which placed 22 cadets under house arrest, and the former began a court of inquiry. The investigation revealed that the riot caused $168.83 in damage (around $3,500 today), and identified 19 ringleaders who were subsequently court-martialed between January 26 and March 8, 1827. Cadets Aisquith, Berrien, Bomford, Burnley, Farrelly, Fitzgerald, Gard, Guion, Humphreys, Johnson, Lewis, Mercer, Murdock, Norvelle, Roberts, Screven, Stocker, Swords, and Thompson stood trial, and other cadets, including both Jefferson Davis (who was among the 22 originally under house arrest, but otherwise went unpunished) and Robert E. Lee testified for the defenses. Eleven of the group (Berrien, Bomford, Burnley, Farrelly, Fitzgerald, Guion, Humphreys, Johnson, Lewis, Roberts and Stocker) were dismissed, and the remainder were allowed to stay, although Gard, Murdock and Norvelle chose to leave the academy anyway. As a result of the riot, in the 1840s when new barracks were constructed, they were designed so that the cadets had to actually go outside to move between floors in an attempt to prevent another mob uprising. Add the liquor into the sugar-egg mixture, slowly at first, beating constantly so it fully incorporates. The risk of contracting Salmonella is very slim, considering the amount of alcohol that any potential bacteria would be floating in.